In the Charcoal & Woodz restaurant in the heart of Cloverdale, John Aldag wrings his hands as he watches the election results roll in on a wall-mounted T.V. “I’m nervous,” he admits. “The Conservative voters still have some time to mobilize.” It’s 6:41 p.m. and the polls close in 19 minutes—but in a race this tight anything could happen, and every minute counts. The room is packed with both Liberal Party members and supporters, excitedly chatting to one another as they watch the steady climb of poll numbers. Aldag paces back and forth across the floor, shaking hands with people and periodically answering his cell phone, all the while keeping a steady eye on the T.V. 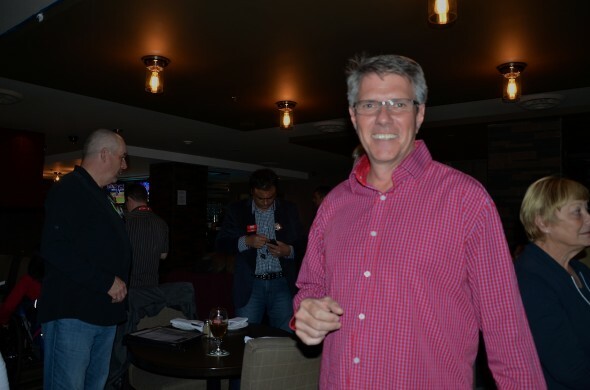 At his side stands his colleague and mentor Rebecca Darnell, who ran in 2011 as the Liberal MP candidate for the staunchly Conservative Fort Langley-Aldergrove riding. “It was a shitshow,” she enthuses, remembering her campaign from four years ago when Mark Warawa’s Tories garnered 64.5 per cent of the vote to the Liberal’s 9.0 per cent. Tonight, though, she’s chosen to regard this election’s prospects with a bit more optimism. At 6:55 p.m. a cheer erupts from the room as the Liberals are the first party to hit 100 seats federally. The tension in the room seeps away as the numbers show how the Liberals have taken an early and surprisingly large lead over the incumbent Conservatives and, though saying it might jinx it, might even have a chance of forming a majority. Less than 20 minutes later another eruption of cheers and applause breaks out with the announcement that a Liberal majority has been reached, and that party leader Justin Trudeau will become Canada’s twenty-third Prime Minister. Rebecca Darnell is beaming. Turns out Darnell’s absolutely right about being able to talk to a Liberal MP, because less than an hour later John Aldag is elected by the constituents of Cloverdale-Langley City to be their representative in Parliament. People jump out of their seats clapping and cheering, congratulating him on his victory, their energy contagious and electric. Aldag thanks all of his supporters and volunteers with a smile, and though it’s reaching the end of the night, this is just the beginning for him and his career as a federal representative of his riding.